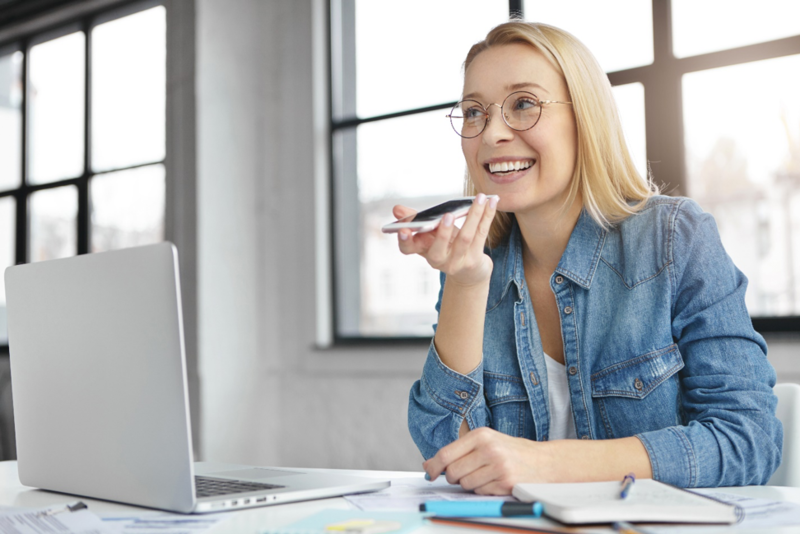 A growing number of companies and virtual assistants now offer voice payments, where all you need to make a purchase, send money, or pay a bill is the sound of your voice. 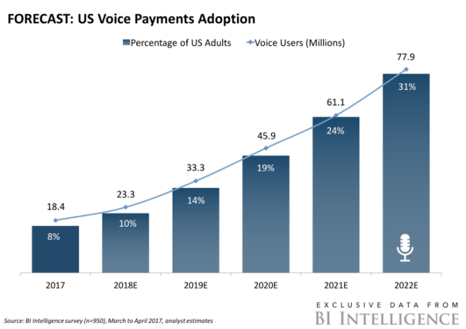 It is estimated that more than 23 million people in the US will have used a voice payment service by the end of 2018, according to Business Insider Intelligence’s 2017 Voice Payment Report. That figure is expected to quadruple by 2022, thanks in large part to the use of voice-enabled virtual assistants like Alexa, Siri, Cortana, and Google Assistant. Voice payments still have a way to go before they become the new standard, but this innovative interface is definitely proving to be the next big thing in payment technology. The use of voice payment technology,also known as conversational commerce, is becoming widespread. 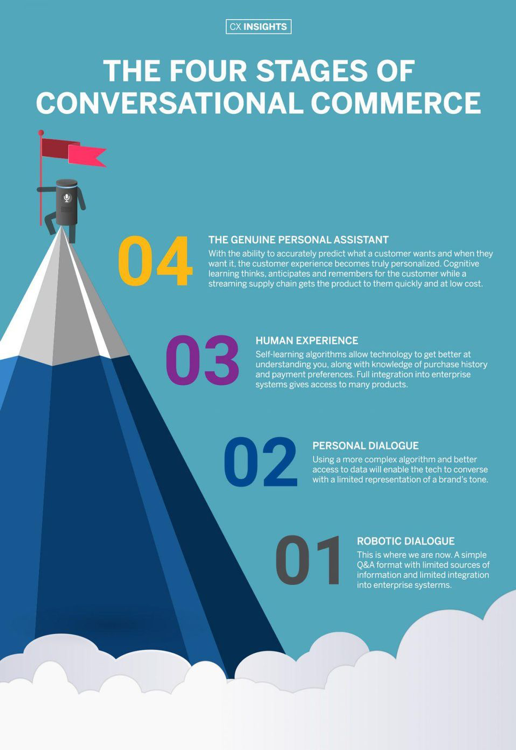 Capgemini’s Digital Transformation Institute reports that 51% of consumers are already users of voice-enabled virtual assistants via a smartphone (Siri, Cortana, Google Assistant), smart speaker such as Amazon Echo or Google Home, or a screen based device. 28% of voice assistant users have used voice payments to make payments or send money, and 35% have made a purchase, according to Capgemini. Google reports 62% of those who regularly use a voice-activated speaker were likely to make a purchase in the next month. What can I do with voice payments? Mobile payment platforms such as Zelle, Venmo, Square, and PayPal are increasingly enabling their users to use verbal commands to accomplish banking transactions and financial functions. Wells Fargo, Capital One, and other traditional banks are jumping on board with voice payment technology, equipping their mobile apps with conversational voice interfaces that allow members to perform a wide range of banking functions through verbal commands. Is voice payment technology easy to use? Capgemini’s survey found that more than four out of five users were satisfied with their voice payment experience. Levels of satisfaction were high for a range of voice payment transactions, including making a payment / sending money, ordering a meal, purchasing products, and booking a ride. 44% of consumers are interested in using voice assistants for banking transactions. Voice-assistant users expect to use voice payment technologyfor 18% of their total expenses in three years, a huge increase over the current figure of 3%. What are the barriers to using voice payments? Security and privacy concerns are the biggest factors limiting consumer adoption of voice payments.Voice recognition technology still has difficulties recognizing certain accents and dialects, although the voice ID system is continually advancing and growing more accurate. As artificial intelligence evolves, conversational commerce is becoming less like dealing with a clunky, scripted machine and more like having a conversation with a highly focused and helpful person. 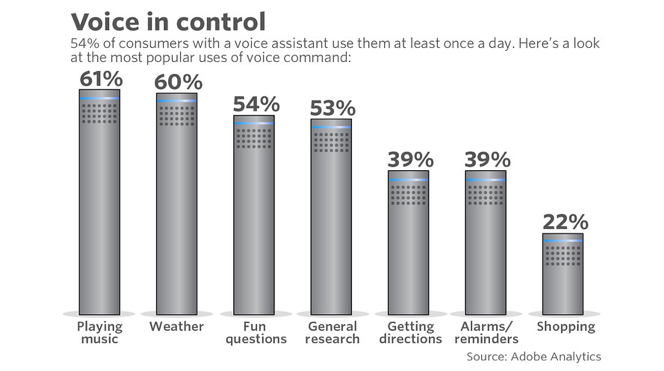 Next-gen voice assistants are expected to outperform the current generation, growing vastly more sophisticated and able to anticipate users’ needs. This will enable them to serve as virtual cashiers, bank tellers, and even personal shoppers. While simple voice payment services have been in use for years through call centers, the services offered through AI-powered virtual assistants are far more extensive. Voice payment technology is transforming the way we shop, pay bills, and perform other financial transactions. RCB Capital Markets predicts that Amazon’s Alexa could generate $10 billion in voice-driven shopping and platform revenue by 2020, according to CNBC. Google Assistant and other virtual assistants will generate significant sales of their own. Companies that want to stay current and capture a share of this revenue will need to adopt voice payment technology as soon as possible. For more information on the latest financial news and how it can affect your investment strategies, reach out to financial planner Matt Logan at www.MattLoganInc.com or call at 336-540-9700. We can help you figure out the best investment strategy to meet your financial and retirement goals. Matt Logan Inc. is an independent firm with Securities offered through Summit Brokerage Services, Inc., Member FINRA, SIPC. Advisory services offered through Summit Financial Group Inc., a Registered Investment Advisor. Summit Brokerage Services, Inc., its affiliates and Matt Logan Inc. do not give tax or legal advice. You should consult an experienced professional regarding the tax consequences of a specific transacton. These are the views of Matt Logan Inc, and not necessarily those of Summit Brokerage Services, Inc. and any of its affiliates and should not be construed as investment advice.